Are there any brick builders in your life? If so, you will definitely want to read on! Everyone in my house loves to build with LEGO style bricks. As children, my sister and I spent countless hours building cars and houses for our mini figures. My hubby is a huge fan of bricks, and loves getting creative with them! It came as no surprise to us as parents, that our son also loves to create with the same types of building bricks. He absolutely loves all things LEGO related, and we have already been to two different fan conventions with him (and he's just four years old!). What could be cooler than a monthly subscription service that delivers building bricks and brick related products right to your door? 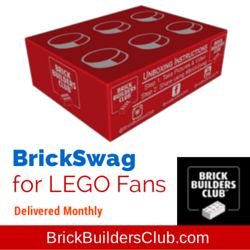 Introducing BrickSwag for LEGO fans from Brick Builders Club! Brick Builders Club is a monthly box of BrickSwag for LEGO fans, and includes awesome items in each box, such as exclusive T-shirts, trading cards, parts packs, activities, techniques/tips, and more! We were beyond excited for the opportunity to try out Brick Builders Club, and to receive the March box, which was a Castle theme! I didn't tell B that this would be coming for him- I wanted it to be a surprise, and boy, was it ever a cool surprise! Our first box- the Castle themed box for the month of March. B immediately guessed that this had to be some sort of LEGO box, and couldn't wait to open it up and see what types of items were inside of it! Check out B's BrickSwag! Whoa, baby- that's a lot of swag! Here's a closer look at some of the items included in our Castle Box from Brick Builders Club. B thought that the LEGO trading cards were so cool! Trading cards are a sort of new concept to him, but he was jumping for joy to receive five cards, and he couldn't wait to show them to his big Cousin C, who was going to the Brick Universe event with us just a few days after we received this awesome swag box! Parts pack, instructions, a brick pic, and a new mini figure set! Check out the awesome T-shirt B received! B couldn't wait to wear the cool LEGO t-shirt he received in his first Brick Builders Club box! It was his favorite color, and had a castle in the background, with two figures about to engage in battle! It was the perfect addition to the castle themed box. We were sent the youth small, which is the smallest size offered in the t-shirts (you can select the t-shirt size at sign-up). The tee is a big large for B, but at the rate he's growing, it won't be long before it's a perfect fit. B couldn't wait to tear into his new mini figure LEGO pack- Knight's Kingdom, Vladek. The mini figure set included 5 pieces, and B had no trouble putting this new dude together by himself. I thought it was really cool that the Brick Builders Club box included a new mini figure. B gets a bit bent out of shape if he doesn't have an appropriate character to use with themed sets. Seriously. The kid is particular, what can I say? Our new mini figure came with a helmet, axe, and shield. The box also contained a parts pack, filled with bricks and other parts needed to build the castle. The instructions were in the little BUILD booklet that came with the box. I was so happy to find that this was a small building project, and one that I could help B with. He gets so frustrated with me when I tell him that we have to wait for daddy to come home and help us with some of the large LEGO sets. We emptied the contents of the parts pack, and followed the step by step instructions laid out for us in the BUILD guide. Step by step photo instructions- always helpful! B, proudly showing off his little castle with flames and flag, and his new mini figure! He was one happy little LEGO fan after he received the box from Brick Builders Club! B couldn't wait to show his daddy all of the cool BrickSwag he received! Hubby thought the t-shirt was especially awesome. Brick building and LEGOs are something that hubby and B bond over, so I am always happy to see them sit down together without devices, and building- letting their imaginations take the lead. Here's a photo of Cousin C, B, and hubby at Brick Universe in Raleigh, NC- end of March, and B proudly wearing his cool new LEGO shirt! Brick Builders Club is so much fun! It's a fantastic treat for your big or little LEGO fan(s). The value of the t-shirt alone covers the cost of the entire monthly subscription, so this is one subscription box that I definitely think is worth the money. Each monthly box is themed, so you'll receive something new and fun each month! Cool, right? We can't wait to see what will show up in the April box from Brick Builder's Club, and we can't wait to share it with you all! A Brick Builders Club subscription would be the ultimate gift for the LEGO fan in your life! Brick Builders Club is Now Enrolling for May! Don't miss out! *You can receive 20% off your NEW Membership by signing up on the Brick Builders Club website. Coupon will be e-mailed to you. You can learn more about Brick Builders Club through their website. Be sure to connect and share with Brick Builders Club through Facebook, Instagram, and YouTube! Use hashtag #BrickSwag to tag and share your photos and videos! Special thanks to Brick Builders Club for allowing us to review and share about their March Castle themed box!